Paper Creations by Patti: Wow...Where Have I Been? Hello my friends....such a long time since I have posted anything, I hope that I haven't been forgotten!?!? When I finished my post the end of April with the last of my design team commitments I knew that I would be using some of my new found time to play and work around home but had no idea that it would be so long before I made another card, how did I ever make it? It has been a busy two months with Rick and I both doing some traveling and projects around our home. We shot in one of the largest sporting clay shoots this past May in South Carolina. What a wonderful time we had, meeting up with old friends and making new ones. I finished 5th in my class in one of my events and was so happy with my small trophy. As there were 1145+ shooters competing I felt very happy to have finished where I did in the overall numbers. Rick has been to Argentina on a hunting trip which went very well with lots of new pictures and memories of a new country. I hope this Spring has been a great time for all of you. This past weekend I finally got back in my stamp room and created a couple of cards. As you can see I used both the sketch and the inspiration of the birds. Paper pieced flowers, Silhouette Cameo and distress inks created this card.... Using the new stamp set "Simply Sketched" by Stampin' Up I stamped the image in Versafine vintage sepia on my frame which was cut with the Cameo, I again stamped the flowers on scraps of K&Co paper which I fussy cut and placed on the label with foam dots. The bird is from the same set and after cutting it out I colored it with my distress inks. I used the part of my flower that I cut from the edge of the label to decorate the inside. How much fun to finally get started back and create something with this great challenge. 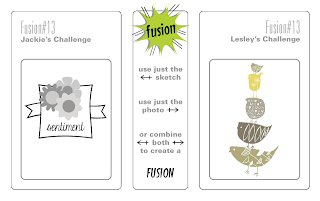 Check out the great team's creations at Fusion and hopefully join in yourself. Just a last bit of newness to my blog....I created my new blog header using digital elements that I purchased from Optic Illusions . Kate creates some beautiful things, please take a look around and say hi to her. So happy to be back in blogland and I hope to visit with you all soon. Hi Patti, its a fabulous card. Good to see you back in blogland. You have not been forgotten and were thought of often. Sounds like you have been having a grand time the last couple of months. I too have not been doing much card making the past few weeks. Love the new blog header that you were so clever to make. Have not tried the Fusion challenge but it looks like you aced it. Congrats on the trophy....that was a lot of competitors at the event. Glad you are back!!! Hugs! Beautiful card Patti, glad to see you posting again, I was beginning to wonder what had happened to you and now I know. Have a good week. really pretty...inside and out! Thanks for joining us at Fusion! So glad to see you joined in the fun @ FUSION - hope to see you again soon!